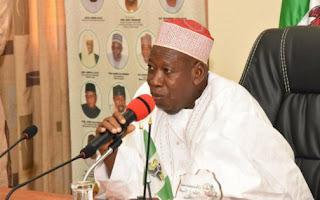 Abdullahi Ganduje of the All Progressives Congress (APC) has secured the highest votes cast in the 2019 governorship election in Kano state. At the end of the collation of results in the 28 local government areas where the supplementary poll held on Saturday, Ganduje secured 45,876 votes ahead of Abba Yusuf, his Peoples Democratic Party (PDP) rival, who had 10,239 votes. Yusuf was leading Ganduje in the March 9 election which was declared inconclusive. He had polled 1,014,474 votes while Ganduje who is the incumbent governor, had 987,819 votes. But with 1,033,695 votes in both elections, Yusuf whose total figure is 1,024,713 is trailing the governor. Bello Shehu, returning officer for the election, will declare the winner of the election any moment from now. The PDP agents at the collation center walked out angrily after the results of the last two local government areas were reeled out. Rabi’u Bichi, PDP chairman in Kano, described the election as a sham.